WHO Forms Human Gene-Editing Committee To Establish Guidelines : Shots - Health News WHO acted in reaction to a Chinese scientist's announcement in 2018 that he had created the world's first gene-edited babies, a step that highlighted the need for uniform gene-editing guidelines. 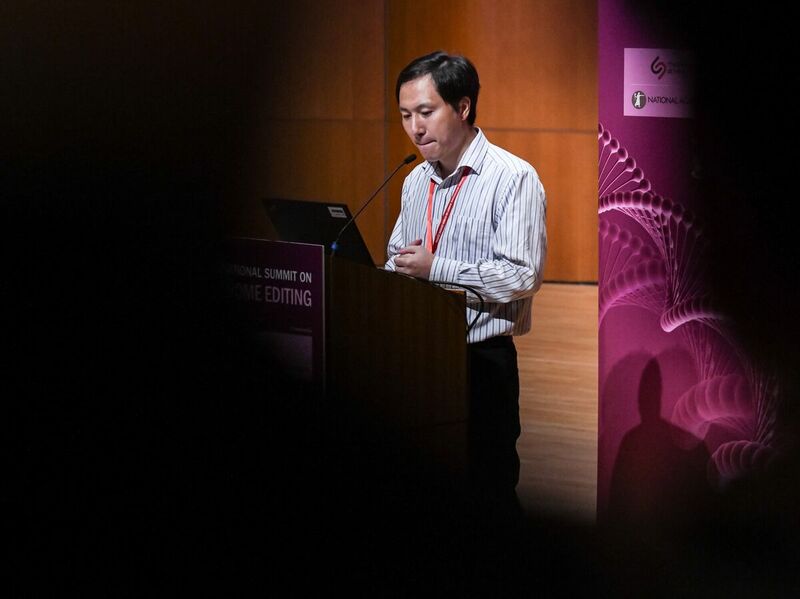 Scientists around the world criticized Chinese researcher He Jiankui's experimental editing of DNA in embryos that became twin girls. "The aim will be to advise and make recommendations on appropriate governance mechanisms for human genome editing," the WHO says. The committee's formation was prompted by the disclosure last year by Chinese scientist He Jiankui that he had created the world's first gene-edited babies, twin girls. That sparked international outrage. Scientists, bioethicists and advocates condemned the experiment as unethical and irresponsible. But many scientists think it may be ethical someday to use the powerful new gene-editing technique known as CRISPR to edit the DNA in human embryos to prevent genetic disorders. Nevertheless, most scientists say it's far too early to try to create babies that way since it's unclear how well CRISPR works to edit DNA in a human embryo and whether it's safe. Chinese scientist He said he had edited embryos to try to enhance the babies' immune systems, to protect them from infection with the AIDS virus. He claims another woman is pregnant who received an embryo created the same way, for the same purpose. He's announcement prompted some bioethicists and scientists to call for a global moratorium on using CRISPR to edit the DNA in human embryos. Others, however, say a moratorium would stifle important research. Instead, they are calling for more specific guidelines for how scientists could ethically proceed with such research. That sentiment, in part, led to the formation of the WHO committee, which is co-chaired by Dr. Margaret Hamburg, a former U.S. Food and Drug Administration commissioner and Edwin Cameron, a justice on South Africa's highest court. Several teams of scientists around the world are continuing to conduct research on editing DNA in human embryos, including a group in New York that recently disclosed experiments that are underway.